Updates to Kiwani's profile since your last visit are highlighted in yellow. I'm a "FAMU" Rattler from Wildcat country with a B.A. in Public Administration. In 1995, I relocated to Chicago to began a new life with Jermaine (Seabreeze C/O 89). Together, we pursued our Master level degrees and returned to the Central Florida area in 2001 and started a family. We are blessed to two beautiful kids, Jayden Bryce-7 and Zariah Reese-2. Kiwani Buchanan Patterson has a birthday today. 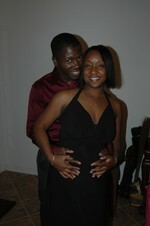 Jermaine & Kiwani still in love 20yrs later! Jermaine with Jayden & Zariah. I am an "Alpha Kappa Alpha" Woman!